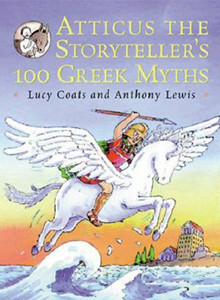 Atticus the Storyteller leaves his home in Crete and sets out on an epic journey round Greece with Melissa, his faithful donkey. His destination is the competition that takes place at the great Storytelling Festival at Troy. On the way he visits all the places where the stories actually happened, and tells the tales to all the people he meets. He survives shipwreck, storms, savage dogs and all manner of obstacles before he arrives at Troy. Does he win the competition? You’ll have to get the book to find out! Meanwhile, on this page you can read a little bit about the competition, dip into one of my favourite stories, and listen to some audio clips. You can also watch a short video of Atticus’s journey! In this extract from Atticus the Storyteller’s 100 Greek Myths, you can learn about how much the Greek gods and goddesses loved storytelling—and meet Atticus and his family for the first time. Doesn’t he have a lot of children? If you look on the video of Atticus’s interactive map of Greece, you can see an actual photograph of the stone Niobe on Mount Sipylus in Turkey! Isn’t it amazing that it’s a real place? This is Niobe’s story. Queen Niobe of Thebes looked at her seven handsome twin sons and her seven beautiful twin daughters playing in the palace courtyard. “Surely they are the most wonderful children in the world, and I am the cleverest mother in the universe to have had them all,” she boasted to her husband Amphion. “I’m better than a goddess at being a mother anyday—after all look at silly little Leto. She may have had one set of twins, but I’ve had seven! I think I should be a goddess too.” And she ordered the people of Thebes to set up statues of her in the temples and worship her. Now gods and goddesses have a nasty way of hearing when humans boast, and sure enough, a little swallow flew up to Olympus and told Leto what Niobe had said and done. Leto called her children Apollo and Artemis to her at once. “Let us teach this woman a lesson,” she said. “Let her daughters be frozen to death by icy moonbeams, and let her sons be roasted by the rays of the sun.” The next morning, when Niobe went to wake her children, all she found in their beds were seven little blocks of ice, and seven little heaps of charcoal. Niobe started to weep. She wept so loud and so long that all the people of Thebes covered their ears to shut out the sound. She wept for seven long years, until the palace was swimming with salt and sadness. Zeus himself heard her cries, and he took her away and turned her into a statue, and set her on the slopes of Mount Siphylus where her father Tantalus lived. But even as a statue Niobe still wept, and the tears of her grief have fallen down the cliffs of the mountain in a great bubbling stream from that day to this.